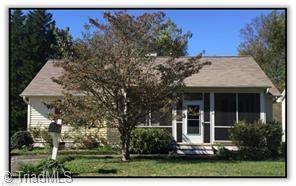 What a Wonderful 3 Bedroom, 2 Bath home in Clemmons! The Home has a 21 X 5.7 Screened in Porch with swing to relax any time of the day! The spacious Living room has a cozy Fireplace and New Ceiling fan, New, Tile Flooring throughout the Kitchen and Breakfast area! Large Master Bedroom with Private Bath. Rear Yard with Wooded Backdrop, Fenced and has a Storage Shed!